This has got to bethe greatest water park in the world! Aquaventure is listed as one of the top attractions in Nassau, the Bahamas, and this insane swimming complex at the Atlantis resort is the largest in the Western hemisphere. However, a day pass comes with a hefty price tag of $110. Ouch. A quick bit of internet research revealed that we could stay at one of the resort's five hotels for less than the cost of admission for one person. Once you're a guest, you can play on the slides from free! Because frankly, there was no way I was missing out on a slide that plummets you vertically into a plexiglass tube submerged in a pool of sharks. The premise of the water park is simple: grab an inflatable ring, or an inflatable figure-of-eight for two, and navigate the mile-long circular rapids. Easier said than done as you plummet over cascading waterfalls and huge waves attempt to overturn your vessel. You emerge regularly into different swimming pools and can paddle your craft along to the next death-defying section of white-water madness. Safe to say, it is absolutely brilliant! Should you tire of endlessly captaining your inflatable hoop, you can haul it from the water and try one of the numerous slides. They were also unfailingly exciting, although you really to have to keep your bottom up out of the middle. My bruised posterior was testament to this fact. Each slide empties its riders back into the rapids, so the ride never really ends. Then there were the slides that you could go on without the rings, including the aforementioned shark slide. Called the Leap of Faith, I was unprepared for the frankly ridiculous gradient which gave me the sensation of falling. I forgot to breathe. I was conscious briefly of being at a great height, before disappearing at enormous speed into the shark pool. As it turns out, you’re going so fast that you can’t see the sharks. You can barely keep your eyes open. 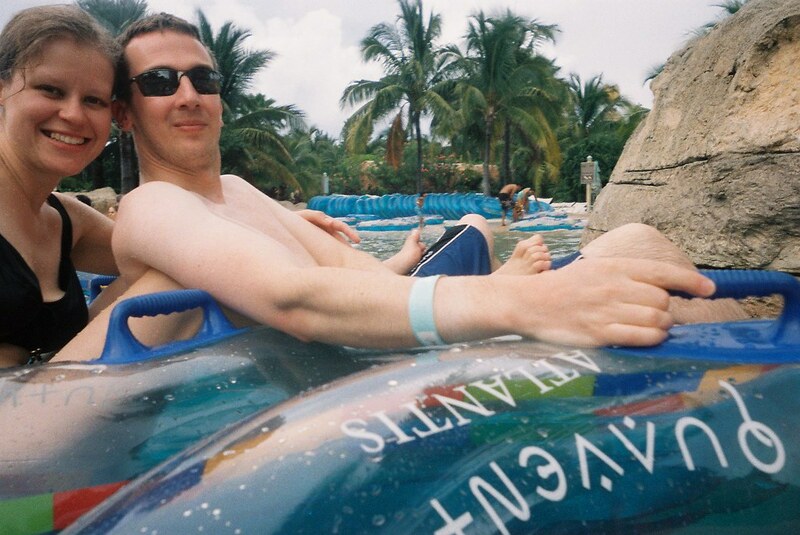 Fortunately, a second more sedate slide back atop the trusty inflatable rings meant that we could float through the sharks unhurried, and marvel at them swimming around us. In the end, we made it our mission to complete every slide in every combination; single rings and double rings. There’s nothing like a bit of compulsory fun! Being out of season, the pools were quiet, we didn't really have to queue and we spent the best part of two glorious days larking around in this crazy, ridiculous, insane kingdom of swimming. 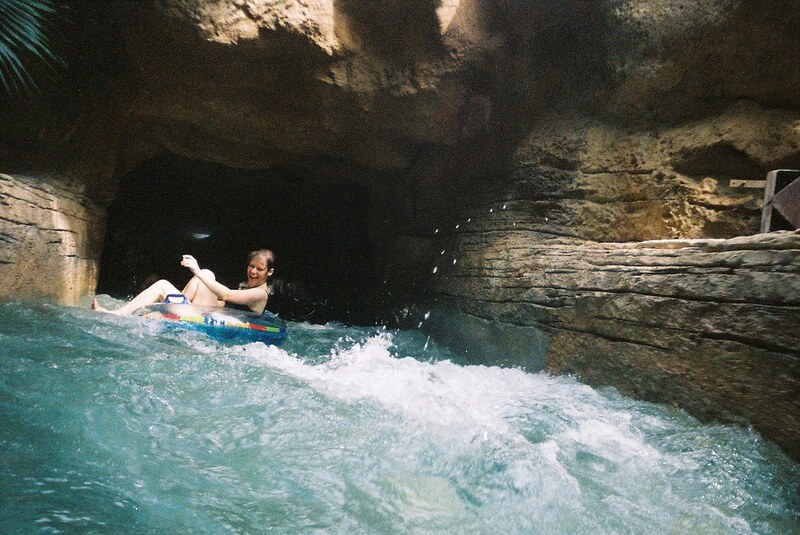 A little waterproof disposable camera came along for the ride, took a battering and documented our adventures. 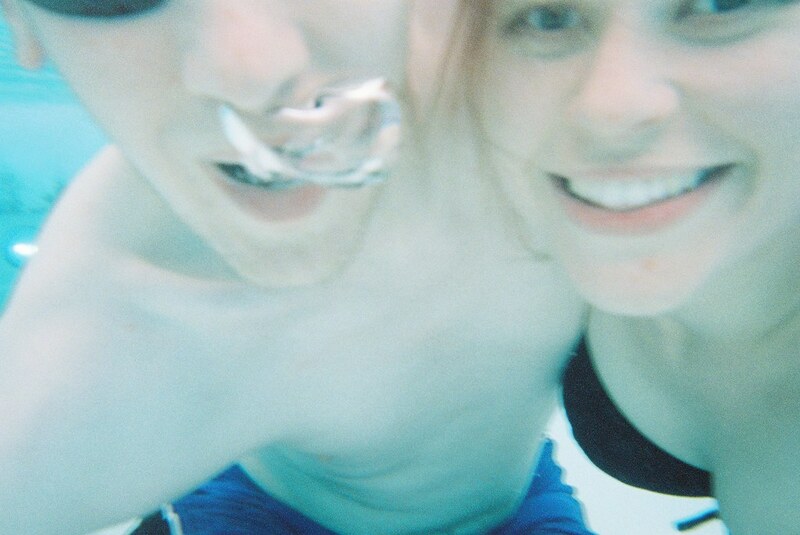 And of course we had to use the last exposure for an underwater selfie. I've never been anywhere like it. But oh my goodness it was fun! P.S. I know these pictures are far from perfect, but there was no way I was carting my beloved dSLR into the pool, or abandoning it on a sun lounger. Given the way we rode rough-shod over the little waterproof camera, I'm actually quite pleased with how these pictures turned out. Blurry, grainy...and fun! 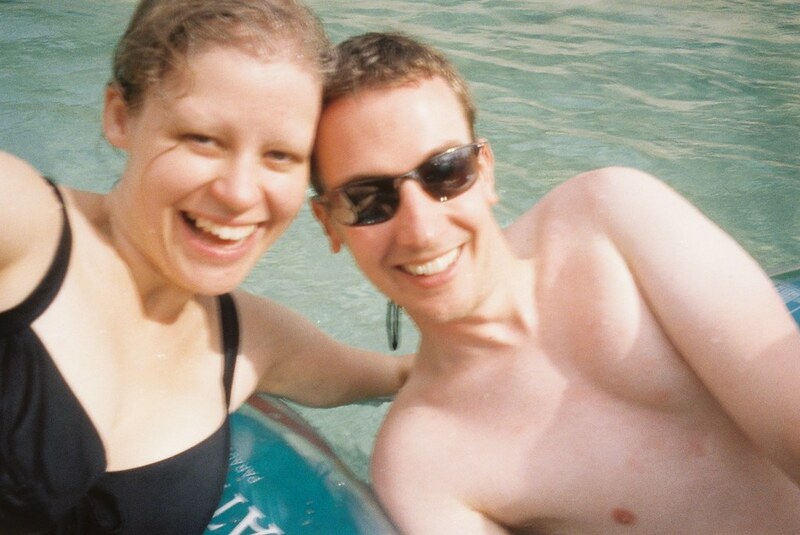 I totally agree on the worthiness of those disposable waterproof cameras! This sounds like a great place but probably best enjoyed during the off season. Lucky you! The mere thought of that place fills me with horror!